A group of five weekly newspapers have raised a quarter of a million pounds between them to finish the building of a day hospice serving their patches. The Archant-owned Exmouth Journal, Exmouth Herald, Midweek Herald, Sidmouth Herald and Cranbrook Herald have won praise for driving the £250,000 appeal. The target was reached in just 11 months by people from all over East Devon organising numerous fundraising events, including coffee mornings, cream teas, a fashion show, a head shave, art auction, sponsored walks, skydiving and golf days. 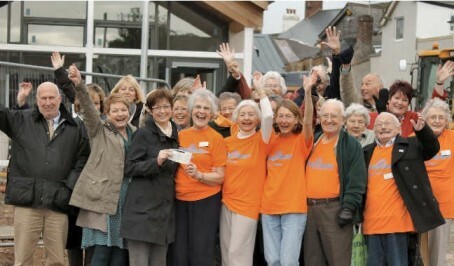 Charity Hospiscare has celebrate reaching the target for the site, which will be based in Honiton. Archant East Devon group editor Phil Griffin, pictured above far left with supporters of the project, said: “With more than 100,000 readers across East Devon, our newspapers have a lot of clout when it comes to spreading a message. “This is a terrific result and shows how generous people are across the area. The new hospice will include spa-like treatment rooms, a patient lounge, a specialised bathroom, a garden, plus educational facilities for the training of healthcare professionals and students, and access to palliative care specialists. The total cost of the building is £1.2 million, with the remainder of the cash brought about through grants and other donations. Glynis Atherton, Hospiscare’s chief executive, said: “Thanks to the amazing support of the Archant papers and the extraordinary generosity of the local community, we have reached our target. “I can’t wait to be able to welcome local people across the threshold and show them what a difference their hard-won fundraising has made. Great initiative. Well done to all.